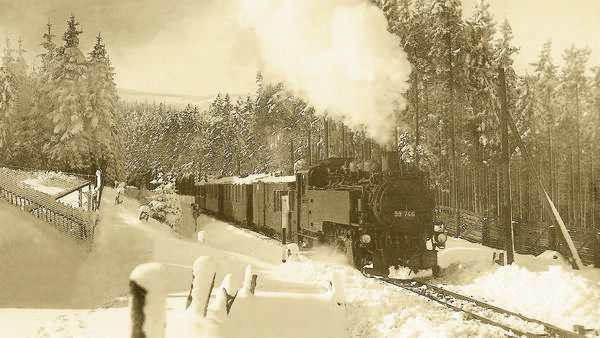 The steam trains of the Fichtelberg Railway cover the scenic 17.4-km (10.8-mile) stretch between Cranzahl and the ski resort of Oberwiesenthal, the highest town in Germany. Trains run on a normal schedule with a travel time of approximately one hour. Fist the route leads through Sehmatal valley to the first interchange station in Neudorf. This charming village in the Ore Mountains is known as the “Suppenland” (soup land) according to legend and for its Christmas incense cones. You can explore these traditions at the Neudorf “Suppenmuseum” (soup museum) or the demonstration workshop, “Zum Weihrichkarzl”. The following stop, Vierenstraße, with its restaurant of the same name, is a great starting point for a relaxing hiking tour or a skiing trip into the Ore Mountains. 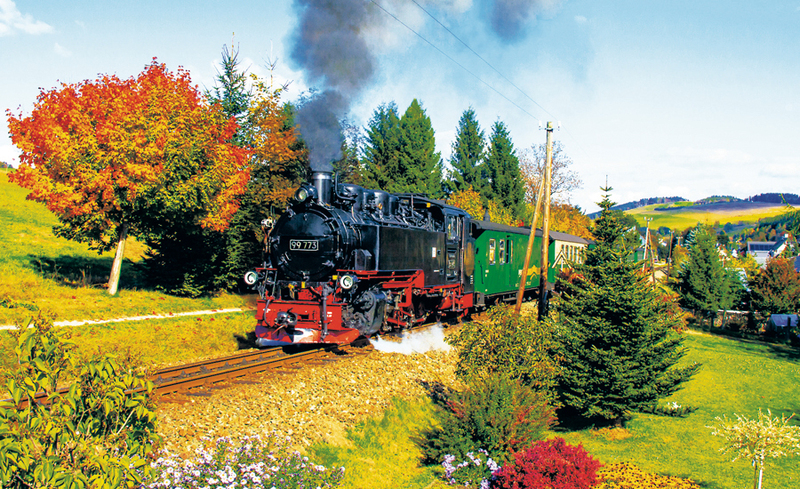 Those who like activity holidays will greatly enjoy a hike on the “Bimmelbahn-Erlebnispfad”. This well-signposted hiking trail leads mostly parallel to the railway and offers many gorgeous views of the steam railway and Fichtelberg mountain. Information boards and various viewing points complement the tour. From Hammerunterwiesenthal station, the route follows along the Czech border uphill to the two highest mountains in the Ore Mountains: the 1,214 m (3,985 ft) high Fichtelberg and 1,244 m (4,080 ft) high Keilberg mountains. Before reaching the station in Oberwiesenthal, situated at the foot of the Fichtelberg mountain, the train leads over an impressive 110 m (360.9 ft) long steel viaduct crossing the Hüttenbach creek. The ski resort of Oberwiesenthal is famous for its many winter sports facilities, even far beyond the Saxon borders. But the mountain town is also worth visiting year round. Besides its perfect conditions for high-performance sport, especially downhill skiing, Oberwiesenthal is also a great place for leisure sports. There is something for everyone, from hiking to skiing, tobogganing to monsterscooter tours. And a Moonlight journey or an evening ride to the “Suppenland” on the Fichtelbergbahn railway are the perfect finish to your active day program. There are, however, more historic vehicles in Oberwiesenthal. Germany’s first suspension railway still carries visitors up to the Fichtelberg plateau. And you might even hear the sound of a posthorn. 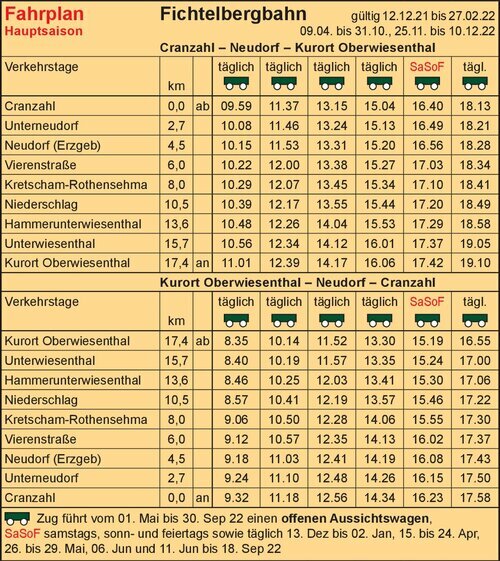 Yes, there is a daily a mail coach in Oberwiesenthal from May to October. The Fichtelbergbahn located south of Annaberg-Buchholz in the immediate vicinity of the border with the Czech Republic. The railway runs from the train station 654 meters to the resort Cranzahl Oberwiesenthal 852 meters altitude railway station. 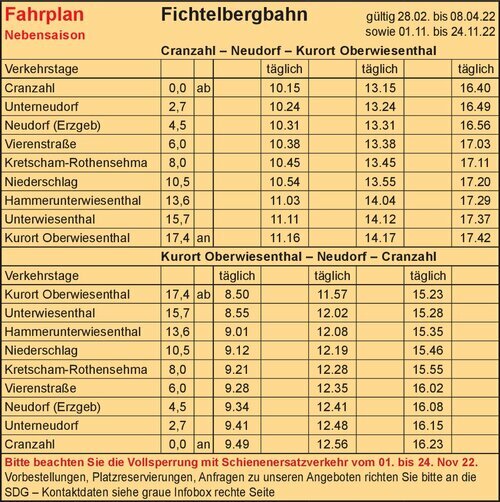 To achieve the narrow-gauge railway from the comfort of Chemnitz with the regional railways of Erzgebirgsbahn (KBS517) that offer Cranzahl connection to the trains of Fichtelbergbahn. Information on the timetables of trains and buses is available online at the Central Saxony Transport Association (VMS). 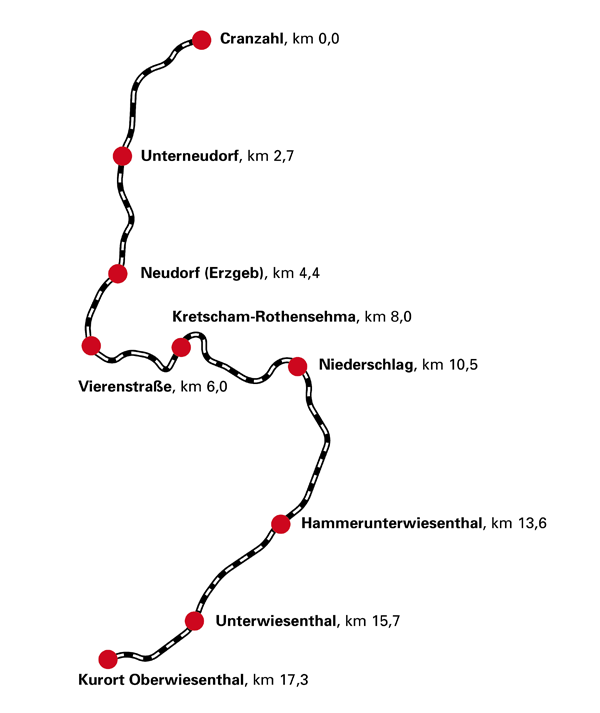 Access by car using the B95, which runs from precipitation to Oberwiesenthal largely parallel to the railway line is recommended. The Fichtelbergbahn runs daily with steam trains.